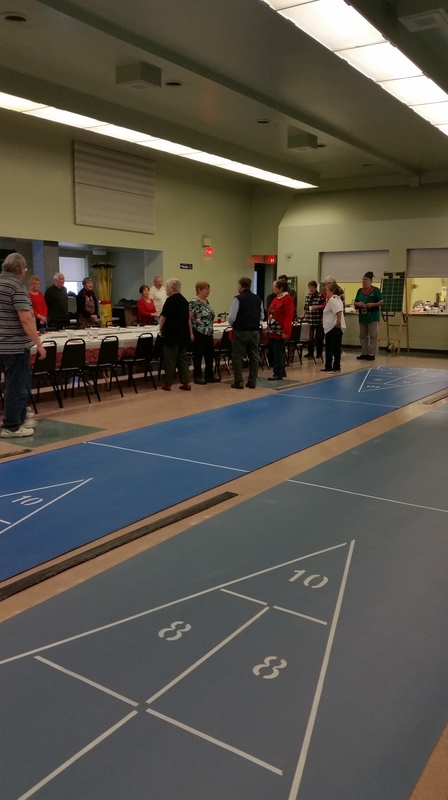 Coldwater Shuffleboard Club held their Annual Christmas luncheon today after playing three games of regular Tuesday morning shuffle. Several of the player’s dressed up for the occasion and they sang and paraded around the courts to get everyone in the festive spirt. 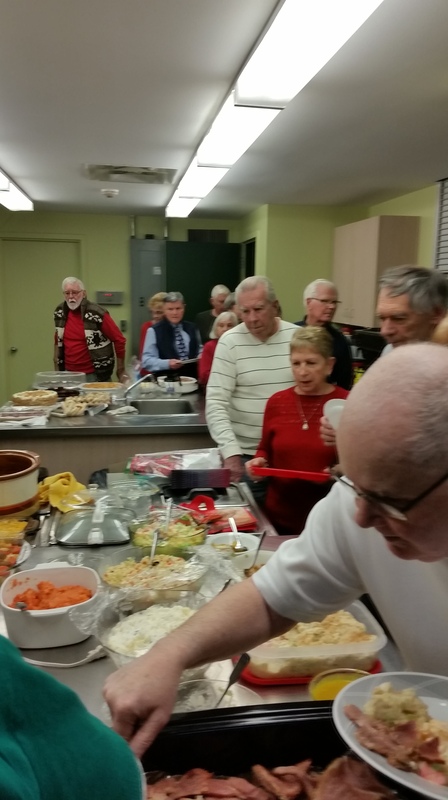 The dinner was pot luck style and the large roast of ham was donated and prepared by Lyle and Elizabeth Fox who have been long time members of the Club. Lyle said he set aside his winnings from the share the wealth draws which the club run each week and from his winning’s was able to pay for the roast ham. The winter shuffleboard has moved to the upstairs hall in the municipal arena where the club play on 6 roll out courts on Tuesday of each week. Today two of those courts were moved over to allow for tables where the players sat and enjoyed a great Christmas dinner. The food was set out buffet style in the kitchen and the players lined up and marched through where they loaded up their plates with the great choices of salads and hot and cold items and a large variety of deserts. 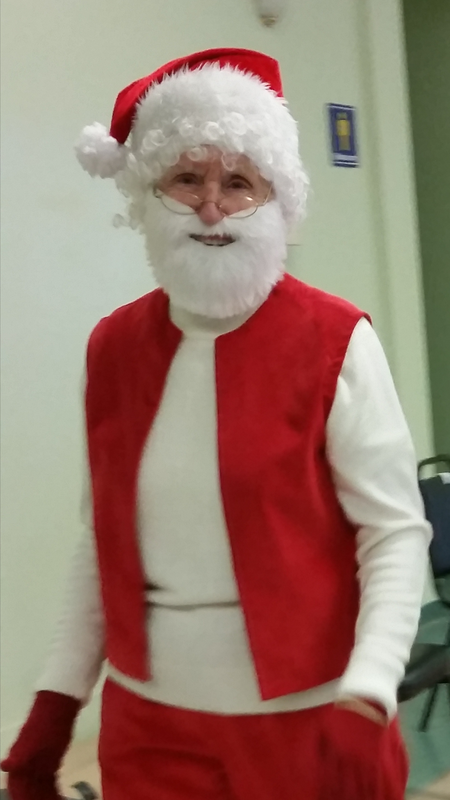 The Club president Carol Archer thanked everyone for their participation and for making the Club such a friendly place to be each week and she wished each and every one a very Merry Christmas. The club will play once more before Christmas break and will back at it immediately after the holidays. We know many of the Coldwater Shuffleboard members are basking in the sunshine at their winter homes in Florida or Arizona and missing out on this crapy Canadian winter with snow and icy roads ” yuk”. 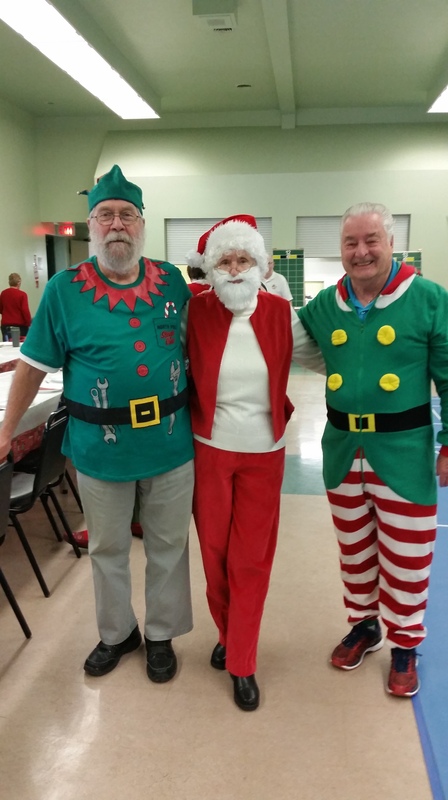 Enjoy your winter where ever you may be ; and may we wish you all a Merry Christmas from the Coldwater Shuffleboard Club. Sent Along By Gary Pipher WITH THANKS!!! 2018 12 11. What a club! 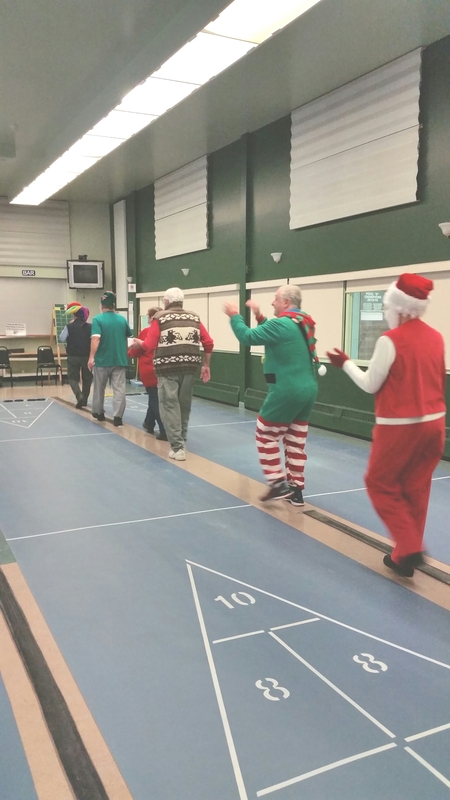 So nice to read your words from Coldwater, Merry Christmas to all, wishing good health and happy shuffleling from all of us from Centre Wellington Shuffleboard Club.